This is a tale about a flag named Bintang Kejora, or Morning Star. As with other flags ever created, it symbolises identity and conveys particular messages the creator would like other people who see it to understand. But unlike other flags, the Morning Star flag is different. Its creation rendered the power outside of it to repress the identity and message it wants to convey. It conversed sovereignty into sufferings, as more and more human bodies, the West Papuans, have to be ill-treated or persecuted of being accused of committing wrong to the Indonesia state. What is right, human rights, then turned out to be very wrong for the power that rule the territory. Unlike other flags ever raised in other areas in Indonesia, such as the Yogyakarta Kraton flag, the raising of Morning Star is subversive to the very fundamental base of Indonesia’s territorial unitary state, or Negara Kesatuan Republik Indonesia (NKRI). December the 1st, each year, marked the conversion of the flag. Fifty three years ago, the Dutch who colonized the territory called Dutch New Guinea gave the recognition to the flag to raise together with the Netherlands’ national flag, and marked the commitment for the Dutch to prepare the transition for independence. The flag raised high to the sky but only lasted for two years, before Indonesia state banned it. And so it has never been up again, to tell the world about peace and sovereignty. 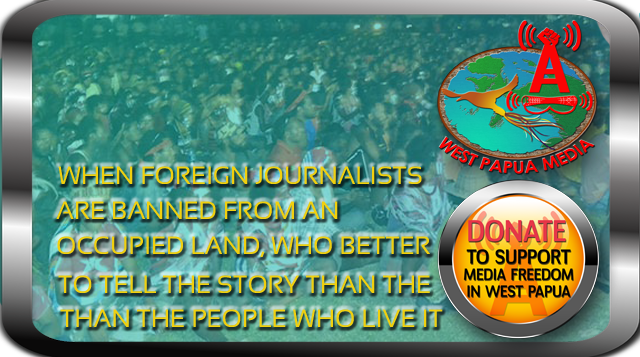 Every West Papuan who tried to raise it will bear the consequences of loosing his lives either in prison or in grave. Or perhaps in none of those places when both life and body are unknown their whereabouts such as tens to hundreds of West Papuans that went missing after military tanks and personnel crushed a gathering of the flag raising led by Filep Karma in Biak, 1998. It was a Papuan named Thom Beanal, with ninety-nine other Papuans, who loudly state that the day when the flag was first raised, 1st of December, is the day of West Papuan independence. He said it in front of Habibie, Soeharto’s successor as the President of the Republic of Indonesia. A scholar, Richard Chauvel, notes that the perception of the flag’s raising on that particular date in the then new political transition in Indonesia gave a new meaning for a nationalist identity of the West Papuans, and convey a message for a new hope for independence (Chauvel, 2005). In 2001, the then President Abdurrahman Wahid, allowed the flag to rise again that year. The Papuans were overwhelmed with joy and new hopes, despite of the facts of their self-proclaimed leader Theys Eluay were jailed by Indonesia’s authority (which then released and murdered in the same year). The next story is again dark and dishearten. The Bintang Kejora has again conversed from a symbol for sovereignty any human need to continue his/her life, into a symbol of the oppressed body, the body full of sins of being itself and thus eligible to be destroyed by the power that rule over it. Every body and soul, who wish to see this piece of cloth with a picture of morning star perform its symbol of sovereignty, will add to more stories of grievances. At the same time, this flag has become more and more strongly wave up in every Papuan’s heart, as hopes for sovereign souls and nation becomes stronger each day. At the flip side of the coin, the flag is more and more threatening for Indonesian authority. Every years before and during 1st December the central government overly reacted to their own insecurity by deploying thousands of military and police personnel to Papua. It’s for the sake of the security of the Indonesian power, indeed, not for the West Papuans, by showing off power and brutally suppresses anyone who has the intention to raise the flag. Anyone. This year, since the last few weeks before 1st of December, already 33 activists members of Komite Nasional Papua Barat (KNPB or National Committee for West Papua) has been arrested and local media Tabloid Jubi reported intimidation against four of its journalists. Amnesty International reported the strong indication of torture and other forms of ill-treatment they have in detention, and extrajudicial killing against some of the activists (Amnesty International, 2013). The last few days when I’m writing this, already several shootings were reported in some areas in Papua. No willingness for any peace dialogue by the Indonesian government has ever expressed. Instead, the choice is always by force and new promises. But no beautiful promises from the central government can ever compensate every injured and destroyed body of the West Papuans who gave their lives to see the flag up in the sky all these times. Not even a promise of a new special autonomy scheme called ‘Otsus Plus’, nor the recent decision by Indonesian parliament to dissolve Papua into another 33 districts and three new provinces. A small numbers of local elites, unfortunately, would trade their souls with such promises, abandoning justice and dignity the rest of the West Papuan people have been struggled and sacrifice all these time. Justice, dignity, and sovereignty. 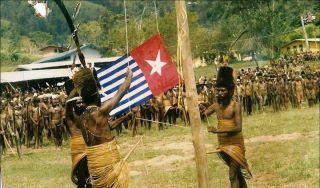 These are the message every soul in Papua wish to convey through the recognition of the Morning Star flag. Sri Lestari Wahyuningroem is a Political Scientist and ANU PhD candidate, and has been a teacher and researcher at University of Indonesia, and has been involved in social activism for issues on gender, democracy, human rights and post conflict. She is also currently a researcher in transitional justice in Indonesian democratisation.